Cat comfort and staying warm is a matter of necessity for a cat, not just a cat whim so a heated cat bed can come in handy. Ever wonder why your cat seeks out warmth when it wears a fur coat? Cats, along with other mammals and birds, are endothermic which means they maintain a relatively constant body temperature. The opposite is ectothermic whereby the temperature varies with the external environment. This is the case with reptiles and amphibians. Being an endotherm has definite advantages because no matter what the weather a cat can spring into action if needed and not have to warm up on a rock first like a reptile does. A cat's body temperature stays a toasty 100-103 degrees, a cat comfort level, hence cats can live almost anywhere. However, to keep the body temp up, cats and other warm blooded creatures must continually stock up on fuel. Reptiles can survive for weeks or months without a meal but birds and mammals cannot. Cats are strict carnivores and have a high protein requirement so they are vulnerable to starvation. 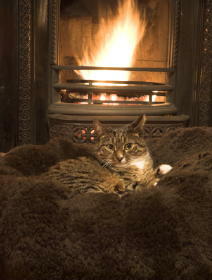 For cats, eating enough to fuel the body's furnace is one way of coping with cold and maintaining cat comfort. When the weather gets chilly, a cat's body can turn up the heat by increasing its basal metabolic rate ...its rate of energy use. A cold cat may also become more active. Muscle contractions generate a lot of heat but in very cold weather, even an accelerated metabolism combined with increased activity may not be enough. When this happens the cat's muscles will begin contracting spasmodically on their own and you'll see them shivering. You should immediately take the cat to a warm, dry place and watch it closely for signs of hypothermia and see to cat comfort. A cat's body heat has many escape routes. Every square inch of your cat's surface radiates heat to a cooler outside environment. A cat that has a large surface area relative to its volume loses more heat than one with a small surface-to-volume ration. You will find that small, wiry cats like my Coty, lose less heat than a big moose like my Max. 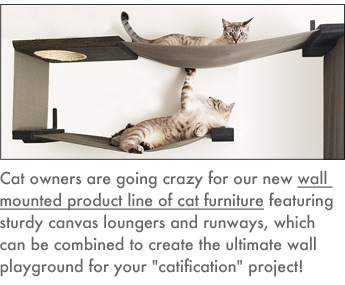 Fortunately cats are equipped with features that prevent undue heat loss to maintain cat comfort. An interesting alternative...Keep your cats warm all year with Heated Cat Beds from Pet Street Mall. Low Prices & Free Shipping! Felines are not equal when it comes to fur, fat, and surface-to-volume ratio. Sometimes the differences among cats reflect ancestry. Thick-bodied cats with long hair and very dense undercoats tend to belong to breeds that originated in more northerly climates, whereas the oriental, fine-boned types with short hair tend to come from warmer climates. 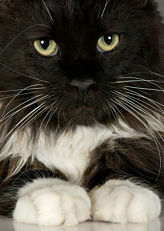 Owners should remember that shorthaired cats adapted to hot weather are likely to become more easily chilled in the cold, and longhaired cats will have the opposite problem. Although I didn't know Chanel's breed when we took her in as a stray, I have since found out that she is a Norwegian Forest Cat which has two layers of fur to help retain heat. The Norwegian Forest Cat also has tufts of fur growing around and in the ear to keep the snow out. They were nicknamed cat-lynxes in times past. 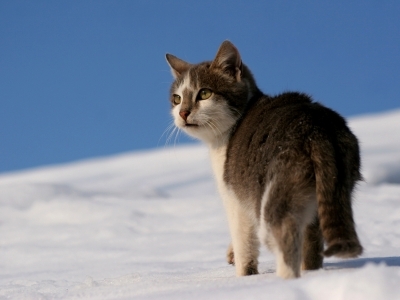 Cats are prone to hypothermia and frostbite during snowy and rainy weather because when fur gets wet, it loses most of its insulating capabilities. The safest bet is to keep your pet indoors during bad weather but if your cat insists on spending some time outside, or if you are feeding a feral cat, provide a dry shelter where the cat can retreat from the cold when needed to seek cat comfort. If you don't have a shed or garage with a small heater then any weatherproof box lined with dry bedding material will do. Hot temperature reverses several of the features that help retain heat. To stay cool for cat comfort it will usually eat less and become more sedentary. It may also shed some undercoat fur and undergo a lowering of its basal metabolic rate. In extreme heat, cats experience peripheral vasodilation, an expansion of surface blood vessels that speeds heat transfer to the outside. Hot cats can also accelerate the cooling process by licking their fur. As the saliva evaporates, it carries away body heat. When a cat becomes uncomfortably hot, it may begin taking quick, shallow breaths...panting...to increase evaporation from the mucous membranes inside its nose and mouth. Panting won't cool a seriously overheated cat. If the cat's body temperature rises several degrees above normal...it may succumb to life-threatening heatstroke. In the early stages of heatstroke, the cat becomes restless, its gums turn bright red, and it begins to pant. Be concerned if your cat starts panting. Cats only pant if they are stressed or seriously overheated. If the cat can't find a cooler spot, it becomes weak and uncoordinated and then goes into shock which is a disruption of normal blood circulation. Untreated heatstroke leads to coma and death. If your cat is showing signs of heatstroke, immediately take it to a cool place and moisten its fur with cool water or wrap it in a wet towel. Don't immerse your cat in ice water. Its peripheral circulation will shut down and all the heat will go into the internal organs causing further damage. Once the fur is moist try running a fan over the cat to increase the cooling by evaporation. Putting rubbing alcohol or cool water on the foot pads may also help. Once your cat appears okay, take it to the veterinarian. Heatstroke can cause lasting damage to the central nervous system and internal organs so to be safe, have your vet check it out. Most cats have good survival instincts but they can be curious critters. A hot, poorly ventilated space that your cat crawls into, then gets trapped if a door closes, such as a closet or a clothes drier...can be deadly. When I leave the house on a hot day, I leave fans on, along with lots of water. I also count heads before leaving to make sure that a cat isn't in a closet or someplace else. If the heat and humidity are high the cat will find a shady spot that's cooler such as a bathroom tile to take a nap. Healthy cats can cope with a wide range of temperatures but on cold days make sure your friend is warm, and when its hot make sure your cat has lots of water and a cool retreat.